Pieter van Naeltwijck is no ordinary car collector. The Monaco millionaire makes his money in real estate, but brings in a little extra by buying and selling some of the newest, most exclusive cars on the planet. When a supercar manufacturer launches a new model, van Naeltwijck snaps it up. Limited editions offer the best returns. "If you're lucky enough to buy them, you can sell some of them for double the price," he told CNNMoney. "There's much more demand than available cars, much like Monaco real estate ... It's a good investment." His collection includes a black McLaren P1 hybrid supercar, as well as some ultra-exclusive Ferraris and Porsches. 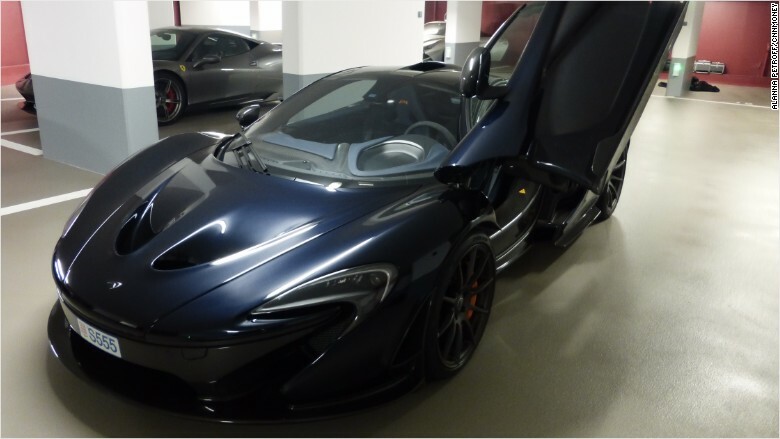 This McLaren P1, seen in Pieter van Naeltwijck's private garage, is a limited production hybrid supercar. Unlike some car enthusiasts, van Naeltwijck doesn't let his prized possessions gather dust in his private underground garage. He drives his cars as much as possible. Then, when he tires of them, he sells them. He estimates he's bought and sold about 100 cars since the 1980s, though he hasn't turned a profit on each one. "I didn't do it as an investment to start off," he said. But then a few years back, the self-professed "car freak" doubled his money on the sale of a McLaren F1, which he bought with a friend for about $3 million. That's when he realized his passion for cars could translate into serious profits. Van Naeltwijck paid about €1 million ($1.2 million) for the McLaren P1 in his garage, but expects he could sell it for double the price when he's ready. There are only 375 of these cars in the world, and celebrity Jay Leno counts himself among the high-profile owners. He also thinks he could sell his red LaFerrari for about €2 million, roughly double the purchase price. The LaFerrari is part of a production run of just 499 cars. These projected valuations for the McLaren P1 and LaFerrari are in line with online listings. Pieter van Naeltwijck, pictured outside his favorite Ferrari dealership in Monaco. 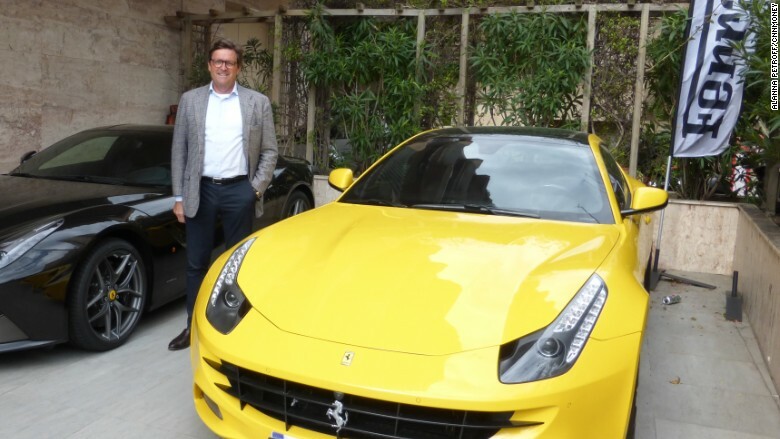 Van Naeltwijck speaks proudly about his relationship with his "favorite" Ferrari dealer, Benoit Mercier. His apartment is next door to Mercier's dealership, and the pair often drink coffee together. This relationship means van Naeltwijck tends to be among the first in line when new Ferrari models go on sale, he said. 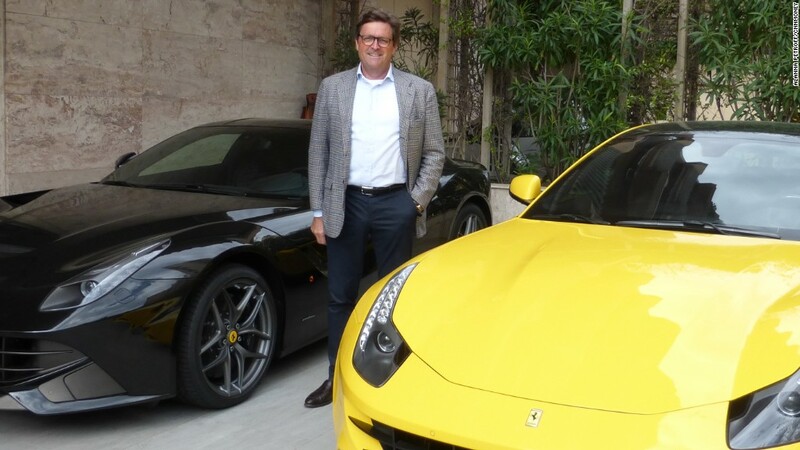 Mercier told CNNMoney that van Naeltwijck is the best Ferrari buyer in Monaco, noting that he has purchased about 14 cars over the last five years. While van Naeltwijck seems to have a special affinity for Ferraris, he's always on the lookout for other purchases. He also owns two Porsches, an Aston Martin Vanquish Volante and a Range Rover, which he refers to in passing as a "people mover."